With only 10 days to go till the end of the ZX-Dev conversion competition, we've once again been contacted by Allan Turvey, that his ZX Spectrum conversion of Joust which is called 'Roust' has again appeared in our news feed but this time as a playable demo.Yes indeed a game that is going to be released by Highrise Electronics Inc, with music by David Saphier and load screen by Craig Howard, is available to download as an early teaser prior to the competition deadline. 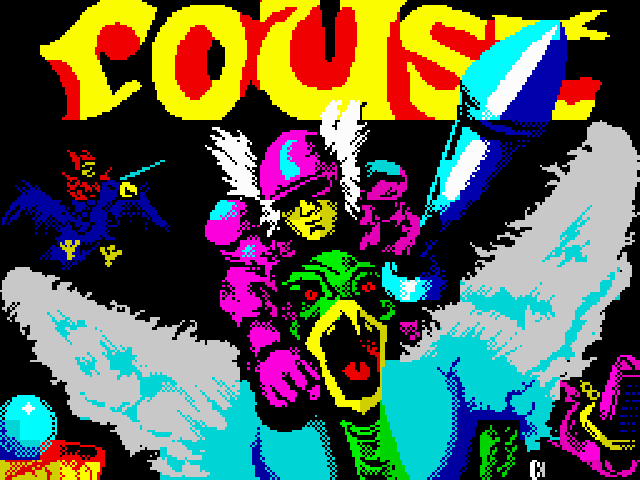 Currently being developed using Arcade Game Designer, Roust is a conversion of the Arcade game Joust which was released way back in 1982, developed originally by William Electronics. It is an arcade game whereby you control a knight riding his very own flying ostrich that had to defeat other flying enemies while also trying not to be grabbed by the ever present hand from below, which also makes an appearance in this conversion.